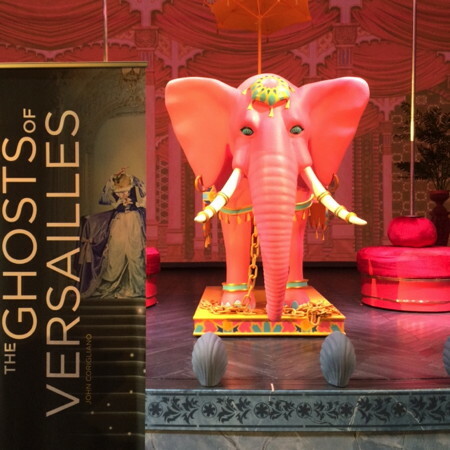 With 61 principle singers (including 41 soloists), supernumeraries, children, acrobats, aerialists, and dancers — and the LA Opera chorus and orchestra, The Ghosts of Versailles has the largest cast ever assembled in LA Opera history. The ambitious production’s director Darko Tresnjak spoke about the herculean task of producing this century’s first full-scale new production of John Corigliano’s grand opera buffa, one of the most acclaimed operas of our time, making its West Coast premiere with this lavish production. ArtsBeatLA was given a sneak peek behind the scenes this week. 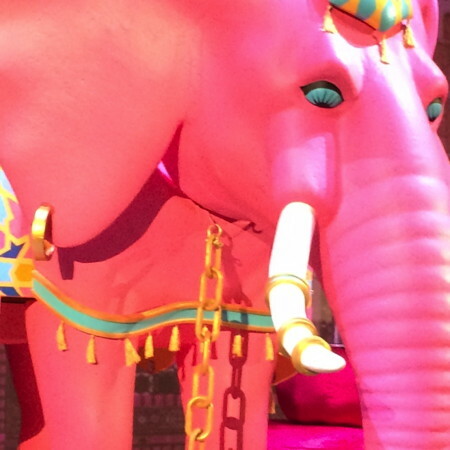 We observed a portion of the set, including a mini pink elephant set upstage center behind a faux proscenium that is topped with a faux cupola. Hot pink, orange and blues suggest muted Indian hues. 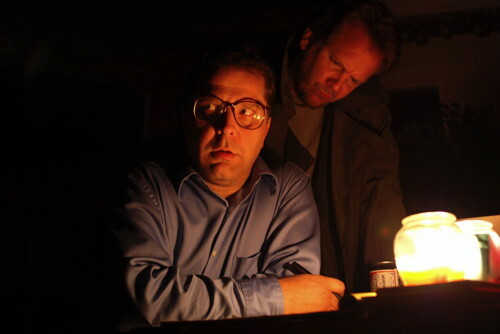 This is Tresnjak’s third collaboration with the LA Opera, having formerly worked on productions in 2008 and 2009. He admits with this one he faced a complex set of challenges. There are three worlds for the audience to keep track of; the ghosts, the Figaro segment and the Pirandello-esque French Revolution scene towards the end. “The Ghosts of Versailles is a wonderful piece that’s a commentary on opera establishment. The Figaro piece we see as a ‘play within a play’ is performed for aristocrats who have been decapitated, which makes it an intentional critique,” he observes. Tresnjak sounded happy to have been given more lead time than he usually experiences when working in the theater. First discussions began 18 months ago, with initial focus on the score. The two authors — the librettist, William M. Hoffman, and the composer, John Corigliano — are still around, so Tresnjak was able to consult with them. “We dissected the opera page by page. They referenced the Marx Brothers… It was a puzzle,” he confides. “I got the idea over year ago, that as there are eleven ghosts in the opera, I assumed all had been decapitated.” He came up with the notion of presenting disembodied singing heads (the singers themselves) and dancing bodies. In order to represent the headless ghosts, they will project photo-shopped images. “Decapitation became a key idea and a very timely one,” he adds, alluding to recent terrorist activities. This set we saw today is like a pop-up book as shot by a fish-eye lens. The world of the ghosts is black white and gray. 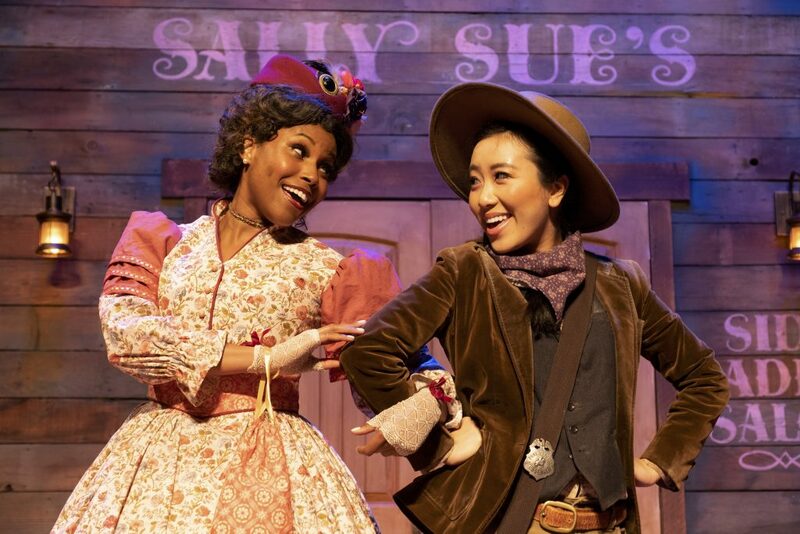 Once we see the ‘play within a play’ — Figaro —that’s when there’s an explosion of color. Explains the director, “I wanted to give Patty LuPone a fabulous entrance, hence the elephant. The authors said that the world of the French Revolution is supposed to be terrifying, so it’s a gearshift; it becomes more real.” The top of the set will blow open to reveal a gallery of jurors holding severed heads. Costumes are by Linda Cho, with whom Tresnjak has enjoyed a long-term working relationship over the past 18 years. “It’s like an artistic marriage,” he muses. “This opera is performance with a capital ‘P’ — even the chamber version is gargantuan.” The work was initially commissioned by the Met Opera. “The Ghosts of Versailles is a contemporary classic and I’ve built my career on classics.” The director hopes he’s giving this work a new lease of life, restoring the original intent of its creators. Patty LuPone made her last appearance with LA Opera in 2007, winning a Grammy, and it was a feather in their cap. Explains Tresnjak, “Her presence telegraphs a lot of storytelling in that eight minute scene. She brings a level of joy, detail and spontaneity that exceeded my expectations. Figaro appears in drag and upstages Patty’s character. There’s a naughty part to that scene — you just have to see it!” he grins. The Ghosts of Versailles is the first opera in the Figaro Trilogy, and opens on February 7, 2015. Review pending. The Barber of Seville will open on February 28, followed by The Marriage of Figaro on March 21. The Figaro Trilogy will be conducted by James Conlon. More information on each opera, including their performance dates, can be found of the LA Opera’s official site.